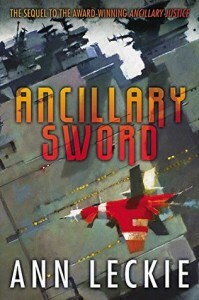 I thought “Ancillary Justice” was one of the best debut SF novels I’d read in years so I was eager to read the sequel. Since the first book had ended with the first shots being fired in what looked likely to be a galaxy-spanning civil war I was expecting that the conflict would probably be the main focus of the sequel but Leckie has avoided writing what might have been the obvious plot. I compared the first book to Iain M Banks’ Space Opera in terms of its ambition, scale and concepts and I’d say the second book does still compare to his work but this time the comparison would be to Banks at his most introspective and character-focused, more like “Inversions” than “Excession”. The book starts with the series’ protagonist Breq being dispatched on a mission to keep the peace in a system occupied by a fairly unexceptional Radchaai colony whose economy is mainly devoted to the growing of tea. The system has a particular fascination for Breq because it was the home of the Lieutenant whose murder had set into motion the events in the first book and her biggest priority is to protect the Lieutenant’s younger sister who still lives there. Although a long way from the conflicts starting to break out in other parts of Radchaai space the inhabitants of the system are still unsettled by the news of a civil war whose causes they don’t really comprehend. Although Breq has been given authority over the entire system the existing powers among the military and civilian administration are either resentful of her or determined to win her aid in their own power struggles. What they don’t initially realise is that Breq is a very atypical Radchaai ship captain and is just as concerned with some of the more marginalised members of a very unequal society rather than the upper classes. Meanwhile, Breq also has to deal with the knowledge that the Lord of the Radch may have sent on this mission but definitely doesn’t trust her and has attempted to send her own agent to watch over Breq. This is not a book that could be described as action packed; although that does mean that the rare moments of violence do have more impact when they do happen. Instead, it is mainly focused on how the characters interact, much of which is governed by the social mores of Radchaai society which has many elaborate rituals governing social interactions and where people, especially the more powerful members of society, are rarely open about their intentions. This is a book where most of the key scenes involve dialogue rather than action; it’s a Space Opera where the main importance of the warships is the power and influence they give their Captains rather than what they actually do. It did take a bit of adjusting to, given the events in the previous books it’s initially tempting to dismiss the events on a relatively unimportant world as a bit of a sideshow and at first it’s not even clear what the focus of the plot is but I thought it did manage to become compelling in the second half of the book and I’d say the ending was probably stronger than that of Ancillary Justice (where the ending was possibly the weakest part of an excellent book). Since most of the previous book had featured Breq either on a newly-conquered colony world or on the fringes of Radchaai society this is the first book where we see either a warship crew functioning normally or mainstream Radchaai society. It does add depth to the setting and although some parts of it are reminiscent of other fictional societies (particularly the inequality between different social classes in a supposedly equal society) it does have an original feel to it. One of the weaknesses of the first book had been while it had a fascinating and distinctive protagonist some of the supporting characters had felt a little bit thin in terms of characters but I think the characterisation is generally better in this book. The characterisation can be fairly subtle, inevitable in a society where people often feel they can’t say what they really mean, but I thought there were some interesting characters here including Breq’s young officer Lieutenant Tisarwat who becomes the centre of some of the subplots. While there’s nothing as attention-grabbing in the characterisation as the first book’s premise of having a protagonist who used to be a spaceship I did think there were some good explorations of how the ancillary technology the Radchaii used to crew their ships has effected their society. The characters have complex motivations and although some of them are outright villains there aren’t any simple heroes in this story. The two main returning characters Breq and Seivarden both get some good character development and their mission does give them both time to come to terms with the events of the first book, seen mostly obviously in Breq’s attempts to interact with the sister of the woman whose death she was responsible for in Ancillary Justice. Overall, I’d say the decision to have a quieter and more low-key story for the second book in the series has been fairly successful even if it wasn’t the sequel I had been expecting.